There's a call from across the room of, "Player is All In," but I hesitate because it is late in Level 1 .. but then I see Billy Casey is at that able, so anything is possible. Yep, Billy stands up and there's no chips on his rail, he has them all in the middle and so does Lorena Chiquillo (above). A third challenger is debating whether to make this a60,000 pot, but he declines and up go the cards. 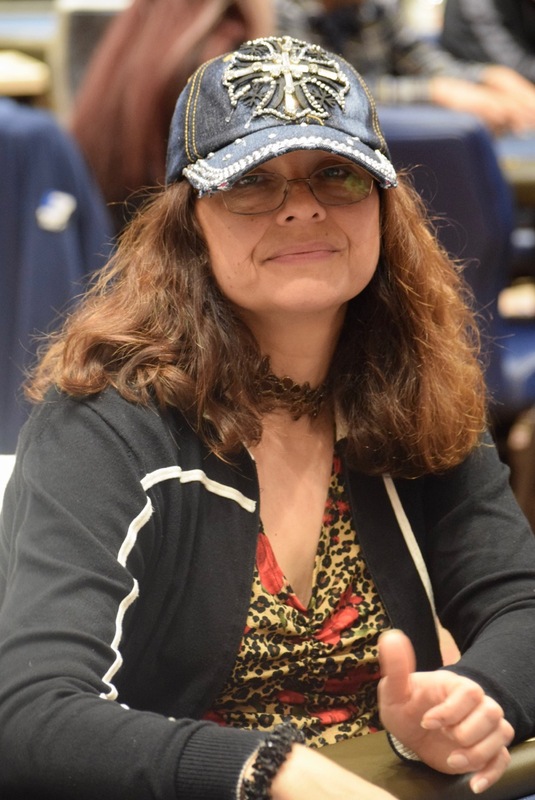 Billy flips up _Pocket_Jacks then says, "Oh wow," as Lorena shows Pocket_aces. Billy gets a backdoor Broadway draw on the K-T-x flop to try and improve, the turn 3 leaves him 2 outs and neither arrives on the river. "Re-enter," time says the person whose range of hands is, well, pretty wide at any time in any tournament.